Previously , I have written an article to use Yahoo smileys in Blogger posts . Now what you would do if you want to add Yahoo smileys in Comment section ??. Yes you can add Yahoo smileys in Blogger comments in Blogger comments using this simple Blogger trick . Open your Blogger templates‘ edit HTML section and click on expand widget templates . Now press Cntrl+F and find out the following comment section in Blogger . Now refresh your comment section . 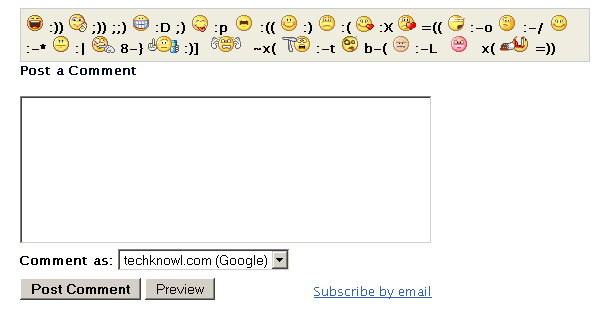 you would see Yahoo smiley icons as shown below . Hi, i just create a new smiley code for blogger comment. It do really work! It has more than 1000+ smiley to be used!